“Although my body has been broken in the past, my spirit never can be. Grant Korgan made history on January 17, 2012 as the first spinal cord injured athlete to reach the South Pole. 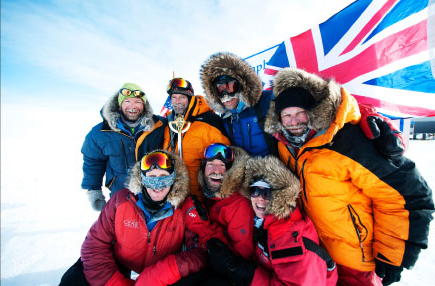 The year-long “PUSH, a South Pole Adventure” project involved extensive training and world travel to properly prepare Grant and the team for the extreme physical and mental challenge – pushing through the last degree, 75 miles across the polar ice cap, on a sit ski, in temperatures averaging 40 below zero, on snow as sticky as Velcro. Despite the incredible challenge and Herculean feat, it was the final steps that define the true essence of this unconditional love story. Unknown to Grant, his wife Shawna was waiting at the South Pole to share his triumphant finish. Grant is now ‘Pushing it forward: “It’s not about what I have done, it’s about what I am going to do – I am sponsored by Love.” By achieving their goal of skiing to the South Pole, Grant and the Push team will continue their mission of raising global awareness for spinal cord injury recovery through speaking, TV and film. Your support and contributions make a difference. Buy an image now. Keoki Flagg is offering an exclusive collection of commemorative photos from the South Pole expedition. 5% of all sales go directly to The PUSH. Follow The PUSH on the Gallery Keoki event page, Gallery Keoki on Facebook and at southpolepush.com. 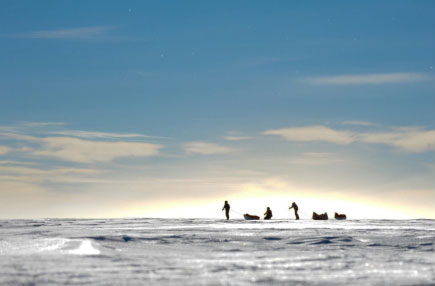 “The PUSH, a South Pole Adventure” was conceived two years ago to raise awareness and provide support for recovering athletes with paralyzing spinal cord injuries. Grant will soon publish his story, which will air as a broadcast television and documentary film scheduled for festival release in late 2012. Grant sustained a burst fracture of his L1 vertabrate while snowmobiling for a film on March 10, 2010. With the unconditional loving support and physical re-hab regimen managed by his wife, Shawna, Grant has overcome all medical recovery predictions. In 20 intense months, Grant who was originally paralyzed (with zero feeling or movement) from the waist down, is walking with arm crutches and recently added “quad sets, stand up elliptical, and spin biking” to his recovery regimen. The South Pole Push Expedition is a for-profit endeavor with the mission of creating a feature film documentary, a broadcast television series, and a powerfully universal message of positivity, with 100% of the project’s proceeds going to two very worthy non-profit organizations! All proceeds from fundraising supports the High Fives Foundation (a Truckee, CA based 501(c)3 committed to help winter-sports athletes whom have sustained a life-altering injury return to the sports they love) – www.highfivesfoundation.com, and the Reeve-Irvine Research Center (one of the world’s best cure-driven spinal cord injury research facilities) – www.reeve.uci.edu. The project’s fundraising goal is realistically set at $2.5 million. This is a call to action – please get involved, join the Push, and support these very important causes. Your Support and Contributions Make a Difference! The Story: Elevating the consciousness of the human spirit enduring through any and all challenges; individual accomplishments though a team project; seeing the beauty in any and all things, while powerfully showcasing the message of Possibility through Positivity™, and the universal truth of love. The Team: Doug Stoup founder of Ice Axe expeditions, Tal Fletcher – is an expert in emergency medical care, rescue, winter mountaineering and group dynamics, Keoki Flagg – world-renowned adventure photographer, Tom Day – critically acclaimed adventure cinematographer, and Peter Nyquist – Norwegian adventurer and filmmaker.